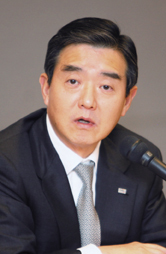 Chairman Kim Yoon of Samyang Group said 2011 would be tough for the Korean economy as the world faces a difficult year with stagnant economic growth. Second, he said, the group’s culture should be centered around performance. “We have to start the transformation of our corporate culture based on performance results and make customers the core of our value through positive efforts of all of us hand-in-hand. “Third, we have to be ready to cope with all kinds of crises as they occur. We ought to prepare the capacity and systems to cope with business environment risks. All of us, officers and staff, should get together to build preventive systems against crises,” Kim said. In the foodstuff sector, too, the company’s competitive strength in the area of homemade foodstuffs has been upgraded by effectively using the existing technologies to make flour, sugar and starch through the newly set up consumer food material business unit, the chairman said. Samyang Group recently declared its 2015 vision, under which it will have achieved solid growth in its key businesses and will have secured remarkable future growth platforms in its new business fields by 2015, thereby growing by over 10 percent each year. Moreover, Samyang recently renewed its determination to take a new leap forward as a global R&D-innovative company after 2015. Marking its 86th anniversary on Oct. 1, Samyang’s employees climbed Mt. Odae to define the company’s vision. Joining the mountaineering activity were 160 employees, including Chairman Kim Yoon and the group’s executives and team leaders. They left Samyang HQ at 6:30 a.m. on Oct. 1 and began to climb Mt. Odae at 10:00 a.m., covering a distance of 12.5 km. The course included Sangwonsa Temple, Birobong Peak, Sangwangbong Peak and Bukdaesa Temple, which they covered in six hours. After the hike they held a simple memorial ceremony at a restaurant near Mt. Odae as well as a rice cake-cutting ceremony in celebration of Samyang’s 86th anniversary. In 2015, Samyang sees itself as more committed than ever to continuing growth in its three key businesses ― chemicals, foods and pharmaceutical drugs ― through the strategy of selection and concentration. It is also determined to secure strong market leadership through an innovation and differentiation strategy and to challenge itself to undertake new businesses so as to build new growth engines. In the chemical field, Samyang will focus on high value-added, high-growth materials and will secure sustainable growth platforms and global manufacturing foundations so as to create bigger customer value. Toward these ends, Samyang will push to expand its capacity to manufacture polycarbonate, to globalize its engineering plastics compounding business, and to develop new high value-added materials. Chairman Kim Yoon of Samyang Group delivers his New Year address in a ceremony on Jan. 3 at the group’s head office in Seoul. 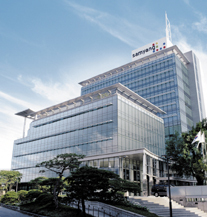 A view of the head office building of Samyang Group in Seoul.